1. They live here, you don’t. 2. If you don’t want your face licked, keep it away from the dogs. 3. High-stepping in the yard to avoid land mines is good exercise. 4. I like my rotts better then most people, and if you’ve ever owned one, you would too. 5. To you they are dogs- to me, they are my family and would gladly, without a moment’s hesitation give their lives for us, would you? We are SUPER excited about our new home in the country and can’t wait to finish construction on Rottieopolis!! Look for Rottieopolis photo updates!! Dr. Jeff Udrasols of Meridian Veterinary Clinic: 317-888-4405. An interview is required before a puppy deposit will be accepted. Please understand that Guardian Rottweilers is family owned and operated with 4 small children, so please limit phone calls after 9:pm except in cases of emergency. Interviews can be scheduled Monday through Saturday, however Sunday is for my Heavenly Father and my family. Please take a few moments to read our page titled “Rottweiler Facts” before scheduling an interview to be sure a Rottweiler is the correct choice for you and your family. When distance prohibits a trip, interviews can be conducted over the phone, however you must have a copy of the GR Puppy Contract. You may print this from our website, or we can mail one to you. If you have any questions regarding us or our breeding program, or would like to schedule and interview, please do not hesitate to contact us. 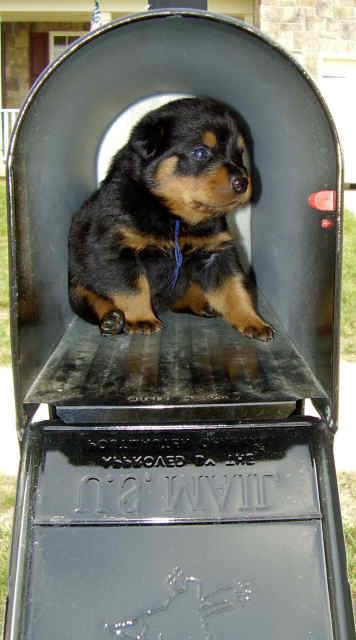 How did you hear about Guardian Rottweilers (if you were referred, please let us know who to thank!)? What is your experience with the breed? If you have previously owned a Rottie, please tell us about him/her. Does he/she still live with you? If no, why not. What are your plans for your puppy, youth or adult (pet, show, working, therapy, breeding, etc.)? Do you want a male or female? Why? Please tell us about where the puppy will live (apartment, house, condo, etc.). Do you rent or own? Fenced yard? Who will live with the Rottie (family members and ages + other pets)? If you would like to set up an interview, please let us know what date/time works best for you. (If a phone Interview is requested, please indicate the best number to reach you on).